Publishers' card files contain information regarding works published, authors' payments, word rates, dates of purchase, and serialization rights. Reprint or syndication rights subsequently sold by the publisher are also included, along with pen names, title changes, and other relevant information. 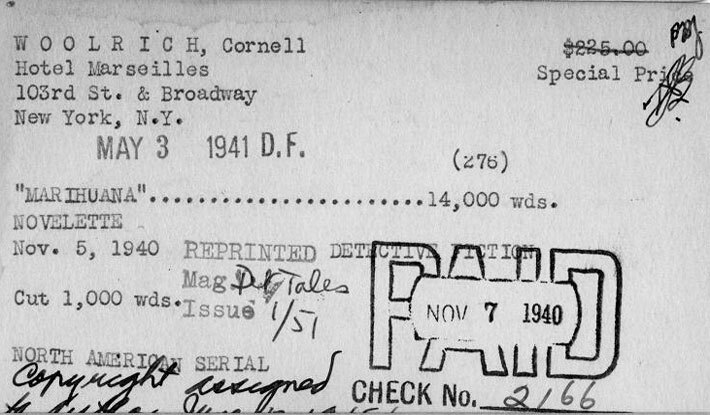 Some publishers' card files even note the amount paid to the typist for retyping a story when it was sold to be reprinted. 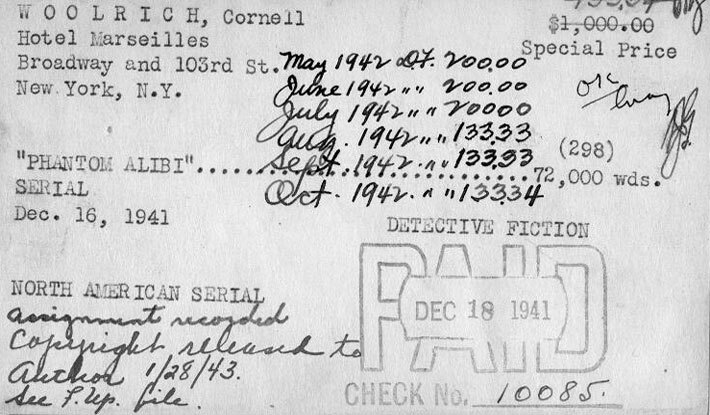 The images below show examples of index cards from the publishing files of Harry Steeger's Popular Publications, Inc. (1930-72), documenting several transactions between the publishers and crime fiction writer Cornell Woolrich (1903-68). Dates on the cards range from 1934 to 1941. New images will be added as they become available. "Murder on My Mind," 7500 words. 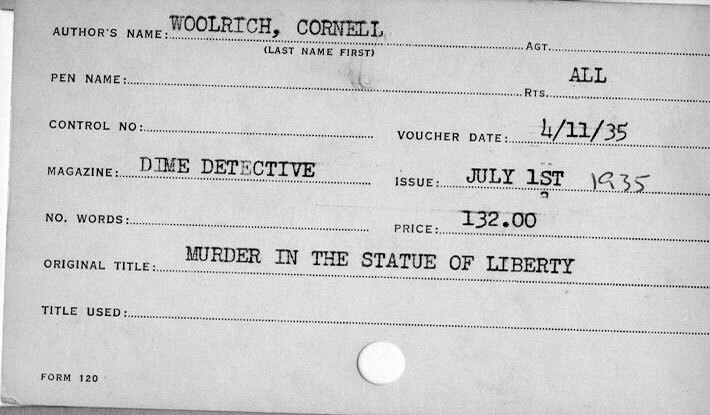 North American Serial Rights, $110; paid on June 4 1936. "Marihuana," 14,000 words. North American Serial Rights, $225; paid on November 7 1940. "Phantom Alibi," 72,000 words. 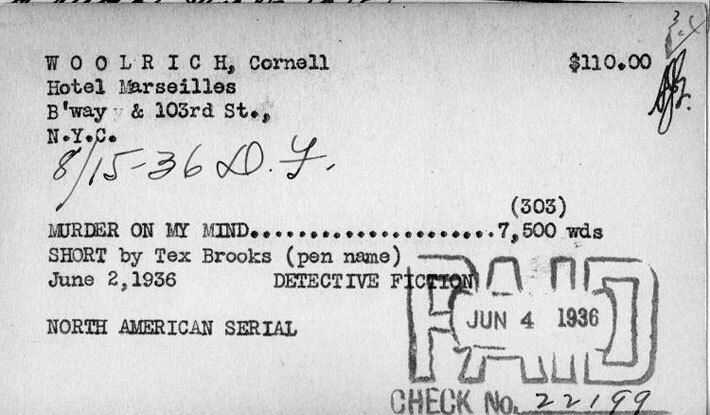 North American Serial Rights, $1000; paid on December 7 1941. "Murder-Story," 10,500 words. 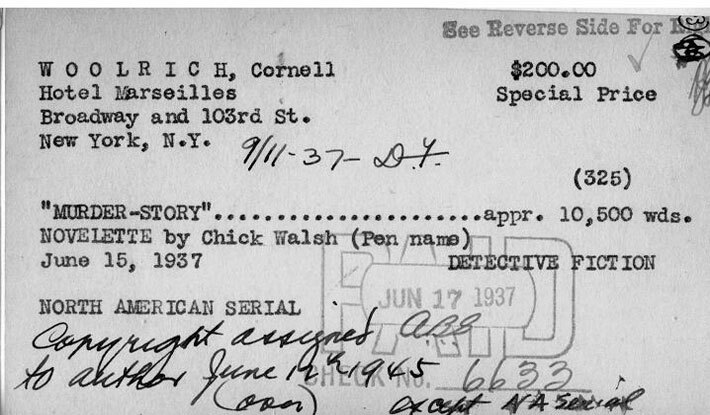 North American Serial Rights, $200; paid on June 17 1937. "Muder in the Statue of Liberty," 72,000 words. 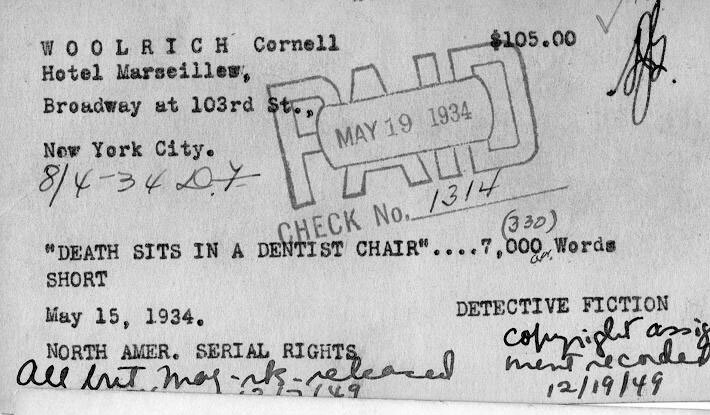 All Serial Rights, $135; voucher dated April 11 1935. "Death Sits in a Dentist Chair," 7,000 words. North American Serial Rights, $105; paid on May 19 1934.